Electric Control Products (ECP) manufactures of Conveyor safety switches, with two main goals; Safety and Production. “Safety and production work hand in hand” says Marcus Coyle Managing Director of Electric Control Products, “without production and safety a company and a safer work environment is not possible”. 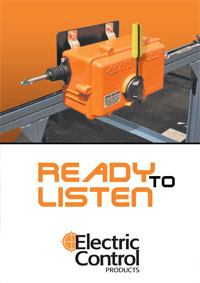 Electric Control Products was established in 1991 celebrating its 20th Anniversary this year. From the foundations they have been committed to developing an increasingly safer product for the mining industry. At the beginning it started with Martin Coyle who sold lanyard conveyor stop switches, manufactured by another company. Whilst in this position he was informed of the products faults in the mining industry. After researching the faults and complaints in the mining industry Martin Coyle started Electric Control Products and developed the Aluminium Cast Lanyard. Marcus Coyle joined the company and as the company grew further new products were designed. Some of these were the belt misalignment switch SAFE-T-DRIFT and the belt tear switch SAFE-T-RIP plus many other types safety equipment. The Safety Switches Electric Control Products produces are Australian designed, made and owned; they also lead the way in Australian safety standard compliance. Their Lanyards – which is one of our best selling and most valued products, they are also CE approved. Emergency stop devices are manufactured to save a person’s life or limbs. By the same token it keeps production flowing. Lanyard switches can sit un-disturbed for years, that’s why these units MUST be fail safe. Maintenance to these units does not always happen, this is why the switches need to be reliable and unfortunately there are brands sold in the mining industry that are not reliable or fail safe. In addition to being reliable, Electric Control Products Safe-T-Pull product also features absolute simplicity in the initial set-up and adjustment, as well as a robust non-metallic enclosure. Their simple design ensures low maintenance, and there is a three fail safe trip mechanism to reinforce safety. The Safe-T-Pull is the device that Electric Control Products focuses on, and that attention is evident to every mine that utilises it. Today the one crucial thing that separates Electric Control Products from any other manufacturers is safety. Electric Control Products spends a lot of their time researching and following the industry, speaking to the mining engineers and mechanical engineers on the mine sites both in Australia and the International market. If there are faults they are pointed directly to the company’s Managing Director Marcus Coyle. This enables Electric Controls Products to make sure the client has the correct equipment for their pacific requirements. Electric Control Products exports to Indonesia, Singapore, South Africa, Finland, Canada and Japan. Electric Control Products hope to expand in time to North America but this is a difficult market to access because they tend to buy local products for their mining needs. Electric Control Products thinks it’s a matter of trying to get someone on the ground in America so they can have a better understanding of the “SAFE-T-PRODUCTS” that are available to them. The SAFE-T range is more than up to par and just needs to be seen by the International market. At the moment the world is looking closely at Australia because of the amount of Iron Ore being produced out of Western Australia and Coal from the East coast. Lanyard switches play a large role in the Iron Ore and Coal mines with their production and safety. Electric Control Products has seen a rapid growth in the last six months with the mining industry. Marcus Coyle hopes to expand on the SAFE-T range, we spend a lot of time designing and developing our products to insure safety. Marcus hopes that in five years we are still a Western Australian based company, and hopefully expanding into other countries and to set up distributors around the world. While ensuring the end product is still the same quality. Electric Control Products with safety in mind is planning to send their lanyard switch to Japan TUV to be performance tested. This will prove the product life-span and performance level. There is a new OHS legislation that will state that all safety circuits must have similar quality rating requirements. There is no product on the present market that has a complete performance level to fit this category. With the redesigning of our new switch plate mechanism this will meet the requirements of the new legislation. 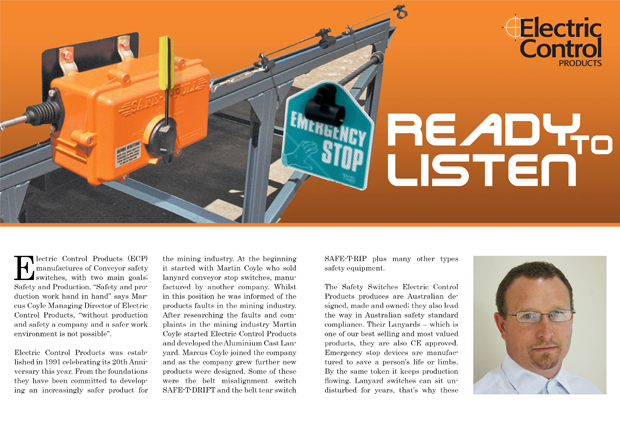 Marcus Coyle believes that by working with the distributors of Electric Control Products together they can help the mining industry with its production and the safety of its workers. Products need feedback in order to meet the needs of the site. If need be the product may have to be redesigned to suit their mining needs. Most of the time product complaints go unheard. Electric Control Products hopes to change the mining industries complaints; communication and product knowledge. As time goes on, Electric Control Products quality only grows. 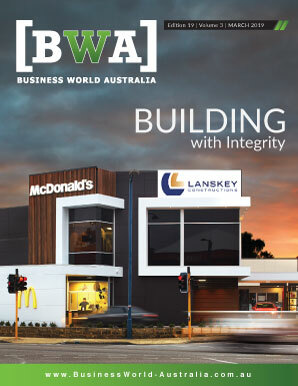 We have been specified with BHP Billiton Iron Ore in WA for approximately 15 years. Recently BHP Billiton has respecified the new switch plate design. This gives our Australian distributor’s R&D Technology and Power Control Products absolute confidence in selling and recommending the SAFE-T range of products. The SAFE-T range sits comfortably with Fortescue Metals Group and in future Electric Control Products is excited to see what the new designs can do for the mining industry.